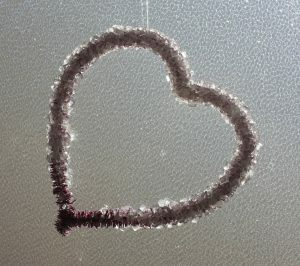 Grow borax crystals overnight to make a beautiful sparkling crystal heart. Use the borax crystal heart as a decoration or simply grow it as a fun crystal project. Shape the pipecleaner like a heart. It’s fine to have a ‘stem’ at the bottom of the heart, since this will give you a way to suspend the heart in the crystal growing solution. You can always clip it later with scissors or wire cutters. Prepare the crystal growing solution by stirring borax into boiling hot water until it stops dissolving. You can tell you have enough borax if a little powder starts to accumulate in the bottom of the container. Add food coloring, if desired. Alternatively, if you want a colored heart you can simply use colored pipecleaners. Place your heart shape into a container. It’s best if the heart doesn’t touch the sides or bottom of the container, which you can achieve by hanging the heart from a pencil or butter knife. However, you’ll get decent results just setting the heart into the container. Pour the borax crystal solution into the container, being certain all of the heart is covered. Try to avoid getting any undissolved solid into this container. Allow the crystals to grow on the heart for several hours or overnight. When you are satisfied with the crystals on the heart, remove it from the crystal solution and allow it to dry. You can hang the heart as a decoration. The crystal heart may be stored wrapped in tissue paper.